Have you had your eye on a Kindle Fire HD? 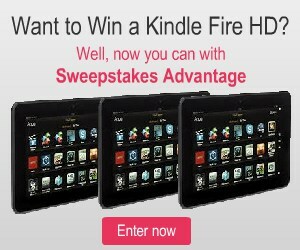 If you love sweepstakes, Sweepstakes Advantage is currently accepting entries for their Kindle Fire HD sweepstakes that runs through 1/31/14! All you have to do is sign up for a Sweepstakes Advantage account if you don’t have one and enter your email address to enter to win. You can also get extra entries to increase your odds of winning by sharing the sweepstakes and/or following Sweepstakes Advantage on social media. Sweepstakes is open to the US.